I received a free trial in exchange for a review. However all opinions are my own. 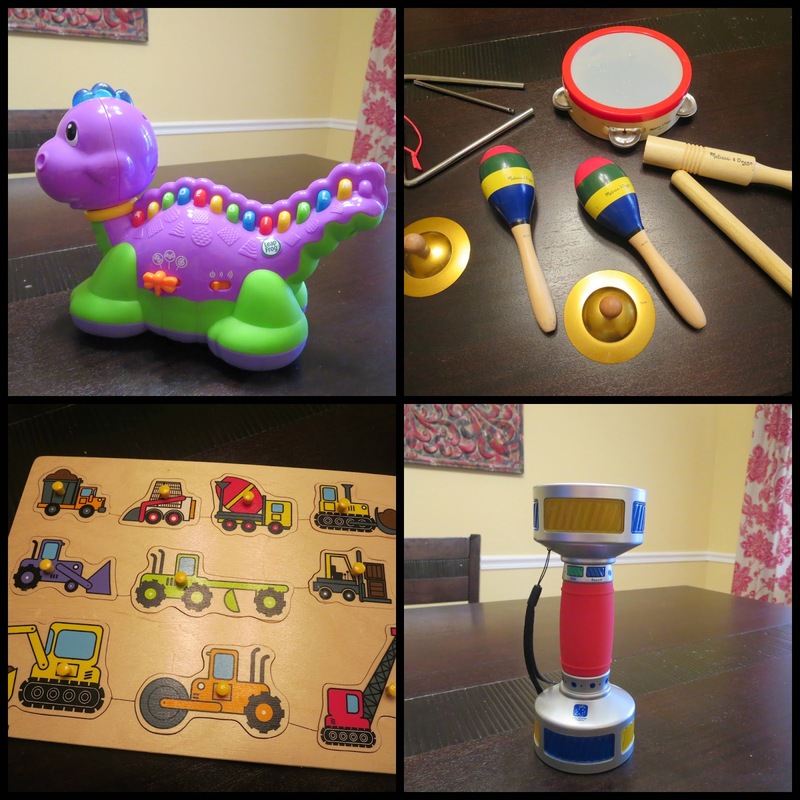 We were recently able to try out Sparkbox Toys, a monthly educational toy subscription service for kids age 0-4. In every box you receive four age-appropriate toys that you return at the end of the month. A return label is provided in the box so there are no shipping fees. If you decide that you want to keep a toy, you can purchase it at 20% off the Amazon price. We received the LeapFrog Lettersaurus ($15.99), Melissa and Doug Band in a Box ($24.99), Hape Construction Site peg puzzle ($11.99) and the Jammin' Gym ($24.99). One of the things I love about Sparkbox Toys is that they provide quality toys and are a green company. Of the 29 brands they work with, only eight are sold in big box stores. You can browse their toys here. They also ship in eco-friendly packaging, use environmentally friendly vendors and recycle old packaging. My kids loved all of the toys, but we ultimately decided to keep the Lettersaurus. Mainly because Cecily refused to let it go! She seriously carries it everywhere and just dances along to the songs it plays. I think that Sparkbox Toys is a great way for your kids to experience toys that they might not otherwise have a chance to play with. They have two plans to choose from, a Sparkbox every four weeks or every eight weeks. In addition to their website, you can find them on Facebook, Twitter, Instagram and Pinterest. I highly recommend subscribing! What a neat way to try out toys! We really like it. I love the fact that the kids get to try something new...and then it leaves my house!